After a week of fantastic weather, the dreary skies and blowing snows have returned. What a great time to revisit the blog! For starters, the final cores of WDC06A finally made their voyage from our camp in West Antarctica to McMurdo Station, the largest of the US Antarctic Program bases. If you’ve visited the WAIS Divide web page, you know that part of this core’s analysis involves a thorough investigation of atmospheric gases, such as methane, trapped in the bubbles of the ice. These gases are preserved best when the ice is kept cold, and for this we ask the Air National Guard to fly what is colloquially known as a “cold-deck” mission. Essentially, the aircraft flies at altitude and vents cold, outside air into the cabin. You can’t get it too terribly cold, but its cold enough for the insulated boxes to have an easier time keep the ice cores icy. I’ve been told that if you’re a passenger on one of these cold-decks, you’ll want to get into your sleeping bag … with EVERYTHING on! 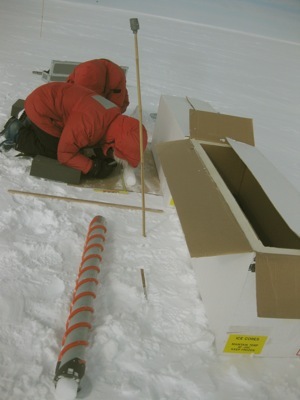 John Fegyveresi, Logan Mitchell, and I were also able to get out a ways from camp to collect shallow firn cores. 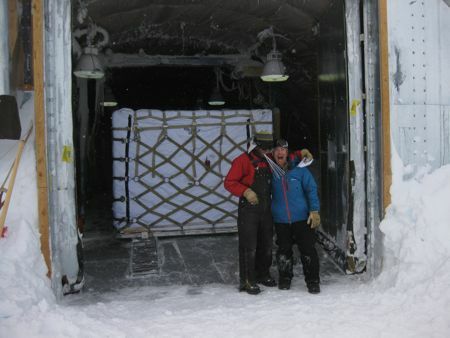 We collected nine 5m cores (as well as sampled a 1.5m snowpit). For those that have read about my Greenland Ice Sheet traverse with Thomas Overly, the three of us used the very same Kovacs Corer (Mark III). 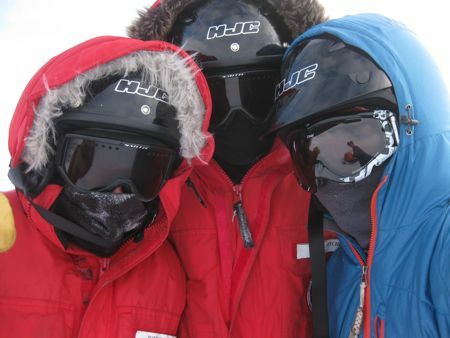 I even tried to imitate the picture Thomas, Galen, and I took of ourselves before embarking on the snowmachine portion of the traverse.